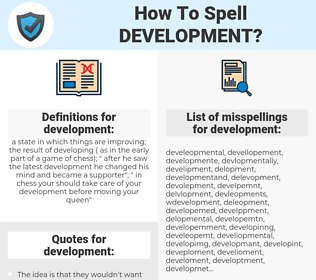 What are the misspellings for development? What are the common mistypes for development? What is the definition of development? What are the quotes for development? What are the rhymes for development? What are the translations for development? 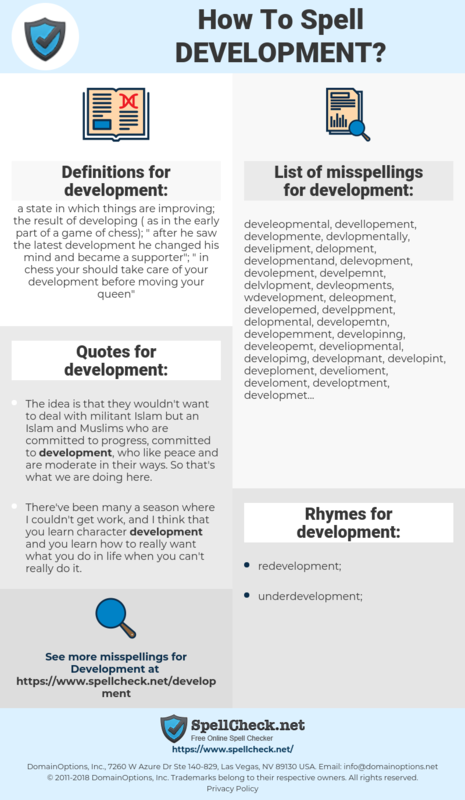 What are the common typos for development? a state in which things are improving; the result of developing (as in the early part of a game of chess); "after he saw the latest development he changed his mind and became a supporter"; "in chess your should take care of your development before moving your queen"
This graph shows how "development" have occurred between 1800 and 2008 in a corpus of English books. The idea is that they wouldn't want to deal with militant Islam but an Islam and Muslims who are committed to progress, committed to development, who like peace and are moderate in their ways. So that's what we are doing here. There've been many a season where I couldn't get work, and I think that you learn character development and you learn how to really want what you do in life when you can't really do it. For origin and development of human faculty we must look to these processes of association in lower animals. Furthermore, the spirit of enterprise which had its first intellectual development in England has especially flourished here as well as throughout all of Canada, while the same spirit has become less virile in the land of its origin. Clearly, programming courses should teach methods of design and construction, and the selected examples should be such that a gradual development can be nicely demonstrated. ontwikkeling, gebeurtenis, groei, evolutie, uitwerking, ontplooiing, uitdieping, ontvouwing. croissance, projet, essor, avancé, développement. Planung, Entwicklung, Aufschluss, Promotion, Aufbau, Verlauf, entwickeln, Ausarbeitung, Ereignis, Werden, Erarbeitung, Erschließung, Bebauung, Bildung, Entfaltung, Ausbau, Expansion, Entwicklungsprozess, Entstehung, Werdegang, Fortentwicklung, Projektierung, Herausbildung, Entwicklungsgang, Formation. 展開, 発達, 発育, 啓発, デベロップメント, 展開図, かいはつ, 沿革, 起こし, 生立ち, けんしょく, ディベラップメント, のび, けいはつ, かいほつ, 顕色, えんかく, はったつ, しんてん, てんかいず, 興し, はついく, おいたち, せいいく, 延び, 生い立ち, 生いたち, はってん, てんかい. rozbudowa, opracowanie, budowa, zagospodarowanie, rozwijanie. projeto, desenvolvimento, avanço, construção, melhoria, progresso, crescimento, andamento, promoção, urbanização. proyecto, desarrollo, explotación, urbanización, acontecimiento, mejora, perfeccionamiento, crecimiento, progreso, fomento, novedades, revelado.